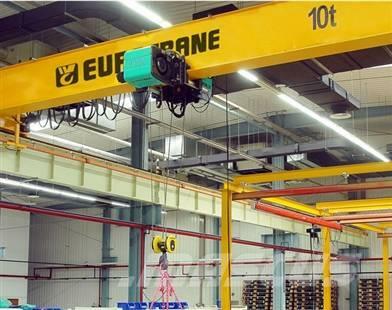 Beskrivelse Eurocrane single-girder overhead cranes provide you with high technology and high reliability, thanks to our vast experience in diverse customer applications and its extensive resources, combine with know-how from a skilled staff. They ensure superior safety and minimum maintenance. The cranes are designed with space saving, ergonomics, and suitable to all the industrial environment, these keep a cost-effective design and let the customer has a good return on the cranes’ investment. På Mascus Norge finner du [Other] Eurocrane Single- girder overhead cranes portalkraner. Prisen på denne [Other] Eurocrane Single- girder overhead cranes er - og den er fra 2013. Denne maskinen er fra China Kina. På Mascus.no finner du [Other] Eurocrane Single- girder overhead cranes og mange andre merker innen portalkraner.